Speed sensors use magnets or optical sources to capture rotational or linear speed. Typically, they are used as gear-tooth speed sensors or are incorporated into stroboscopes or tachometers. Technology choices for magnetic speed sensors include magnetoresistive, inductive, variable reluctance, Hall Effect and optical. Magnetoresistive sensors incorporate the resistance of the sensing element as a function of the direction and magnitude (proximity) of an applied magnetic field. Inductive sensors incorporate an oscillator circuit that generates a radio frequency (RF) electromagnetic field that radiates from a ferrite core and coil assembly. The field is directed at the sensor face. When a metal target enters the field, eddy currents are induced into the surfaces of the target. This causes a reduction in the amplitude of the oscillator circuit (change in inductance). Variable reluctance magnetic speed sensors are most often self-generating. In other words, they do not require an external power source. When a magnetic surface is passed in close proximity to the sensor, a small voltage is induced. Hall Effect magnetic speed sensors function by passing a current through a semiconductor material. When a magnetic field is applied perpendicularly to the surface of the semiconductor, a voltage is developed. This Hall voltage is proportional to the applied field intensity, driving the magnetic speed sensor. Optical speed sensors use a light source with reflective tape to measure speed. The light source can be visible, infrared, or laser light that reflects off reflective tape and then is read by the detector. Performance specifications to consider when selecting magnetic speed sensors include rotary speed range, linear speed range, and accuracy. Rotary speed and linear speed are two mutually-exclusive ranges. With rotary speed sensors, the speed is measured in revolutions per minute (rpm). This is useful for gear speed or belt speeds. With linear speed sensors, the speed is measured in inches per second. This is useful for linear speed applications such as web processes and robotic arm movements. Accuracy is measured as a percent of the full-scale range. A lower percentage indicates a more accurate device. Electrical specifications to consider when selecting for magnetic speed sensors include power requirements and output. Power requirements — Some magnetic speed sensors are self-generating. Others use direct current (DC) or alternating current (AC). Outputs — Common outputs for magnetic speed sensors include resistance, voltage, current, and frequency. Magnetic speed sensors carry display options and control options. Display options include analog meters, digital readouts, and video displays. Control options include analog front panels, digital front panels, or computer controls. 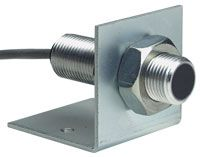 Body-style choices for magnetic speed sensors include barrel, limit switch, rectangular or block, slot, and ring. Other features for magnetic speed sensors include shielding, an intrinsically safe (IS) rating, short circuit protection, weld field immunity, the sensing of non-magnetic targets, and the sensing of non-ferrous targets. Hall effect position sensors are non-contact devices that convert energy from a magnetic field into an electrical signal. They use the Hall effect, a voltage caused by current-flow in the presence of a magnetic field. Hall effect proximity sensors are used to detect the proximity, presence or absence of a magnetic object using a critical distance. Inductive linear position sensors and switches are noncontact devices that determine an object's coordinates (linear or angular) with respect to a reference. 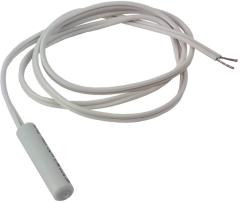 Inductive proximity sensors detect the presence or absence of an object using a critical distance. Magnetic proximity sensors include devices that work on inductive, variable reluctance, magneto resistive or Hall effect principles. Proximity sensors detect the presence or absence of an object using a critical distance. Magnetoresistive linear position sensors and switches have a linear resistance output signal representing the distance an object is from a reference point. Variable reluctance linear position sensors and switches are non-contact devices that use variable reluctance based technology, and whose output signal represents the distance between an object and a reference point.